There is a probability, that Z-21 has originally been I-5. Assumption: She won in Geneva in 1954 and was then sold to Swiss ownership. Anyone having access to historic data on both sailnumbers, please place a note here. 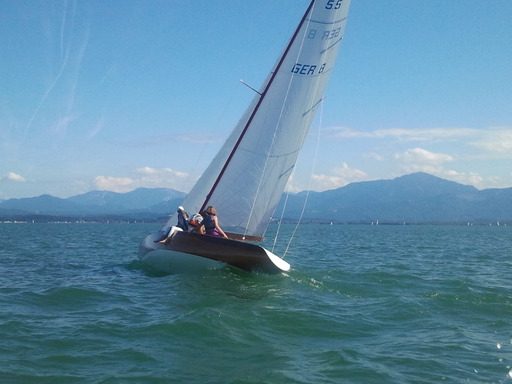 The boat has been restored by boatbuilder Johannes Bandtlow and is sailing on Lake Chiemsee. An owner registration will follow, as soon as a software solution for regsitration doubles has been solved. She is "8b" whereas "8a" is Surprise 5.5 GER 8. An earlier assumption, that Z-21 has been I-5 originally is off the list, as that boat has been found in La Spezia, now. We can therefore combine the data of 5.5 I-9 to Z-21, which became GER 8b. Winner of the 27th Scandinavian Gold Cup 1955, Sandhamn, Sweden, with Max Oberti.